These quotes from famous marathoners illustrate the importance of the final miles of a long-distance race. Similarly, the final stages of the EHR buying process are radically important for medical practices attempting to successfully complete the journey. Indeed, purchasing an EHR takes plenty of stamina. First, medical practice leaders have to define exactly what their healthcare organization needs in terms of technology, features, and functionality. They have to compare offerings in a market flooded with hundreds of products. Then they need to test a few of the front-runners to see which system is actually the right one for their practice. Finally, they come to a handful of top candidates. Now all they have to do is reach for the price tag and purchase the least expensive option, right? Wrong. Instead, practice leaders need to get a true handle on costs. • Hardware: Physician practices typically need to purchase additional computers and servers to run the electronic records solution. Some practices also are purchasing mobile computing devices such as tablets to work in conjunction with their EHR. • Implementation and training: Software vendors typically provide some kind of training with an EHR purchase. Practices, however, are often required to bring in additional training resources during the process—and sometimes for many months or years after the initial implementation. • Professional support: With an EHR, physician practices sometimes need outside help to keep the system running optimally because existing staff capabilities are insufficient. Medical practices often have to pay to bring in a lawyer to review the purchasing contract, a technology professional to establish the IT infrastructure, and a project manager to keep the implementation rolling. Pinpointing exactly what an EHR will cost, however, requires much more than simply considering these potential costs. To get a true handle on the financial ledger, medical practice leaders must push hard and ask more probing questions of vendors. What is the cost if additional training is necessary? Certainly, many EHR vendors will offer training as part of their initial package. But practices need to find out exactly what is provided for “free.” For example, an EHR vendor may offer one full week of staff training, but what happens when a staff member doesn’t take to the system or when the practice hires new staff members? Practice leaders need to factor in these training costs. Don’t ask if it is possible to import information into the system. Instead, find out how much it costs to import demographic information from either paper or an existing system. Importing patient data from other systems often carries a steep price. Typically, a data bridge must be set up between an existing system and the new EHR. Find out if the vendor charges to set up a Health Level Seven International data bridge or if such data import services are offered for free. If data storage is included, ascertain the amount and the cost of additional space. Data storage is a crucial concern for EHR users and becomes more important as time passes. Practice leaders need to find out how and where data will be stored. In addition, they need to know if there are any limits on the amount of free storage. From there, they need to assess current and future storage needs and budget accordingly. One of the most important benefits of an EHR is its ability to electronically order and receive lab results. Besides determining if their EHR can perform such a task, practice leaders need to find out if there is a cost for this integration. How long will it take to complete the project? It may take several weeks or even months to complete the integration work, and the disruption could cost an organization plenty in terms of lost productivity. What type of vendor support is available, at what times, and at what cost? Most vendors include some type of technical support with the purchase of an EHR system. However, it could be limited. For example, the vendor may offer only remote support during regular business hours for a six-month period. As a result, the practice would have to pay for support that is needed after 6 PM or hire on-site support. Get an implementation timeline to get a better idea of its true cost. Although the implementation service itself may come with no costs attached, installing the software is bound to have a disruptive effect on a practice’s workflow. Therefore, a system that takes four months to implement will be a lot more expensive than a system that takes four weeks to get up and running. Most practices use numerous forms, charts, and letters. Practice leaders will want to move these documents into a digital format. Will the vendor perform this digitization? Also determine the cost of importing paper documents into the EHR. Is there a limit on the number of documents that can be transported for free? Frequently, physician practices need to bend an EHR’s functionality to meet their specific needs and preferences. How much customization is included in the purchase price? What is the cost of any additional customization? The Continuity of Care Document and the Continuity of Care Record are important elements of patient history. Is the vendor’s EHR capable of supporting the exportation of these documents or is there a charge associated with developing this capability? Will patients have access to their medical record? If this capability is not available, does the vendor have plans to incorporate a patient portal? If so, what are the associated costs, if any? 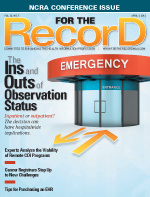 Providing patients with access to their clinical records is becoming increasingly important. Patients want to be able to go online and enter and access information. In addition, such online communication plays a more significant role in meeting the requirements of stage 2 meaningful use. It’s important to ask how the EHR will reduce costs and help the organization realize a long-term positive return on investment. In essence, practice leaders need to determine whether the solution will improve practice management and streamline overall processes to help the organization operate in a more cost-efficient manner. — Vish Mehta is president of PatientClick, an EHR company based in Cleveland, Ohio.